this is actually a modified recipe from my family. our family have this favorite chinese restaurant in cipanas, west java, named sudi mampir (read: come and visit). this sudi mampir speciality is their porridge. because it took 2 hours at least (without the massive traffic jam like nowadays) to reach the place, me and my mother’s craving created our own version of “the sudi mampir porridge”. their basic is chicken porridge, but it also comes with shrimp, fish and also crab porridge. i visit the place a couple years back, and it is still so good. big portion for IDR 25,000 per bowl (quiet pricey but worth every spoonful). along of my mother’s illness of cancer in 2004 – 2006, she crave this. i somehow develop my cooking ability through my years living by myself, and perfected this particular porridge recipe. throughout my father illness also he always asked me to make a pot of this porridge for him. after passing so many things, i could say this recipe is the one i keep my memories the most. and i put all my love, sweat and tears every time i cooked them. i always cooked this for my loved ones, best friends and families. it always keep the sick to feel better, stop pregnant mothers from their craving and it actually could beat the flu. and today, i share it to the world :) enjoy folks! 1. boil together the rice, the whole chicken, crushed garlic and ginger in one pot of water. stir them occasionally. 2. pour in the fish sauce, sesame oil and cooking wine, stir until they form a texture. it usually took less than an hour or so. keep on stirring. 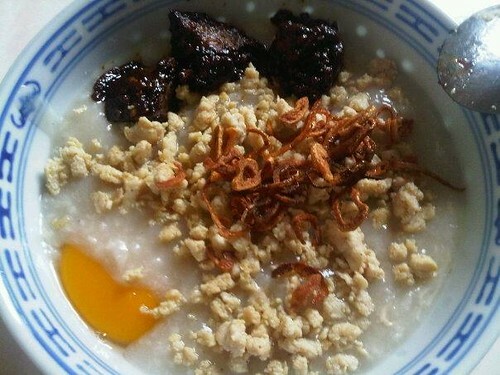 3. the texture of rice porridge can be made as u wish, either it’s light texture (more watery) or a more creamy ones. add water if it’s necessary. keep on stirring until it’s done. 1. pour in the cooking wine to the mince chicken, put garlic, sesame oil, salt and pepper. mix them. leave them for 15 minutes. 2. stir fry them in a pan with cooking oil, stir them well until slightly golden brown. put them as topping on top of the porridge. ahahhahahha, maksudnya catering gitu? :P hwahahhahaha. should we make this tomorrow for brunch kaka?